Acute cardiac events such as myocardial infarction (MI) and sudden cardiac death (SCD) remain leading causes of death in the Western world. The underlying cause of these events is atherosclerosis, which consists in the continuous build-up of lipid material in the intimal layer of the vessel wall, accompanied by chronic inflammation. Fatal coronary thrombosis frequently results from the rupture of plaques that have a large lipid core, separated from the lumen by a thin fibrous cap. Plaque erosion accounts for most of the remainder of coronary thrombotic events. Patients with an acute coronary event are preferably treated with percutaneous coronary intervention (PCI), whereby a catheter is introduced into the coronary artery and advanced to the culprit lesion to restore blood. This allows for intravascular imaging with catheter-based OCT during injection of contrast agent or saline that displaces the turbid blood. OCT currently offers the highest spatial resolution for intravascular imaging, and enables the assessment of fibrous cap thickness, aspects of plaque erosion, and investigation of response to drug and device intervention. Despite the merits of contemporary intravascular imaging, there remains a need for improved imaging methods to better characterize plaque morphology and composition. We are advancing polarization sensitive OCT to enable intravascular polarimetry and obtain additional insight into plaque morphology through the polarization properties of different plaque components. 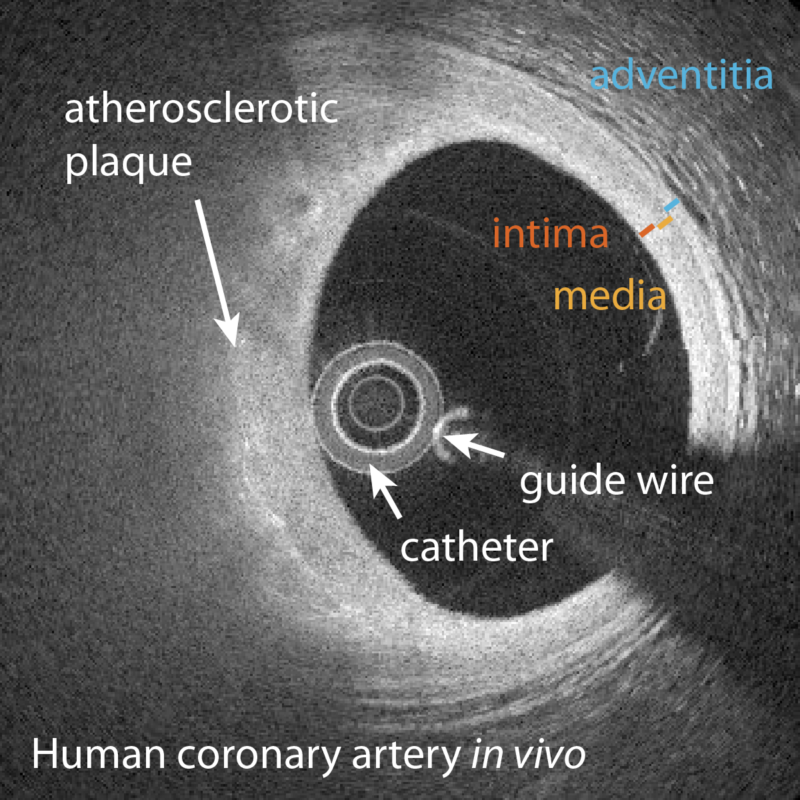 We are also developing methods to quantify the flow surrounding the catheter and assess arterial function and complement the structural assessment of coronary atherosclerosis available with OCT.
Bouma, B. E., Villiger, M., Otsuka, K. & Oh, W.-Y. Intravascular optical coherence tomography [Invited]. Biomed. Opt. Express 8, 2660 (2017). Yonetsu, T., Bouma, B. E., Kato, K., Fujimoto, J. G. & Jang, I.-K. Optical coherence tomography– 15 years in cardiology. Circ. J. 77, 1933–1940 (2013).